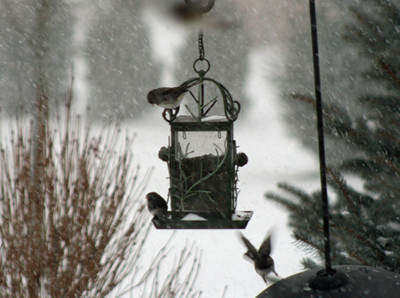 Today as I sit looking out my dinning room window, sipping my coffee that is brewed to perfection, I look out in my back yard to discover the birds have found the feeder placed for them for winter. They come in flocks having told their little friends of the abundance of food for them in my yard. Their excitement is obvious as they flutter in place to find a spot to perch and feast. Now with the snow having arrived earlier this week, finding food becomes a harder job for these littles creatures, so the banquet of seed that my feeder provides is welcome. The irony of this is not lost on me. I sit with my coffee in the silence of my dinning room, gazing out into my back yard watching them jockey for position. I have a tremendous fear of those little feathered creatures. Their little beady eyes and tiny beaks frighten me. The fear of them coming to close or actually touching me is more than I can bear. When I was 10, my parents took me to London. We walked forever but when we came to the steps of St. Paul’s we paused. Just like the song from Mary Poppins, there was a Bird Woman feeding the birds. The difference was, she was not selling bags of food for tuppence. My dad became excited for me as he pointed out the Bird Woman. Proof that magic happens. I stood and watched the woman with her arms out stretched. She held food in her hands and the birds would land on her and feed. She was covered in birds. My brother was amazed at her gift to talk to the birds, he also had a gift with animals. One day at the beach he walked up to a Gull and picked it up. The Gull trusted him and never tried to fly away. Eventually the bird tired of his attention and nipped him gently as if to say “I need to go now”. I remember thinking my brother was the bravest person alive. Now as I stood before this Bird woman, I knew it wasn’t bravery, it was magic. She had a soft gentle manner that could reach the minds of the birds and they trusted her. Just like the Gull trusted my little brother. My grandfather had a love for birds. He would build birdhouses and feeders. Placed them in his yard and tried to attract special rare birds, not just the sparrow which is so abundant around here. I saw him once hold out his hand and a bird came to eat from it. He tried to get me to do the same but fear held me back. These moments came flooding back to me this week. I met a woman who took a “Staycation”, a vacation at home. She made a point of going to the bird sanctuary so her staycation would feel like a vacation. She brought her penny whistle. She would listen to the cadence of the bird calls and answer back in the same fashion. She stayed in the same spot in the trees and just kept communicating back and forth with the chickadees. Soon the little birds started coming to her. She had no food for them, just her whistle. Birds started landing on her bag and she would answer their calls. Soon they were hopping on her. She talked about the fear she felt inside but managed to remain calm on the surface. She felt their sharp little claws clinging to her hands. Then one little bird flew up and hovered in front of her face. She was so frightened she closed her eyes and stayed perfectly still untill she could no longer feel the air moving in front of her face. Once she closed her eyes, the birds left. She felt tremendous disappointment and then immediately wished she looked that bird in the eye. Fear does that to a person. It can fill you with the regret of doing something different. Fear also can give you the confidence to do it differently the next time. Now that I look out over my yard I see the little birds have left for now. They will be back with friends now that they know where the seeds are kept. There will be a next time for them. My next time is coming up soon. I know how I will do things differently. Introspective does that for me. Next time won’t escape me.